Thursday 7:00AM -Drive to Moab Utah via I-70 and 191. 2:30PM -Big Bend Campground, campsite #13. 4:00PM -Check out the Windows section of Arches National Park. 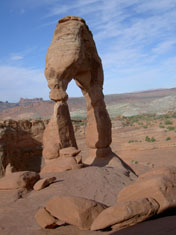 Friday 8:30AM -Hike the Devils Garden section of Arches National Park. 2:30PM -Hike the Klondike Bluffs section of Arches National Park. 4:30PM -Back in Moab for a shower (Moab Swim Center) and dinner at the Moab Brewery. Saturday 7:30AM -Wolf Ranch and Delicate Arch hike in Arches National Park. 10:00AM -Ranger hike of the Fiery Furnace section in Arches National Park. 2:30PM -Back in Moab for a swim and shower at the Moab Swim Center. Sunday 8:30AM -Drive back down 128 and I-70 to Glenwood Springs, CO.
12:00PM -Afternoon at the Glenwood Springs Hot Springs Pool. 5:30PM -Drive East through Glenwood Springs Canyon to Dotsero and then North into National Forest to camp. Monday 9:00AM -Breakfast in Glenwood Springs. 10:00PM -Hike up to Hanging Lake. 1:30PM -Drive back to Denver.